Book reviewed: Kode, Kimberly. 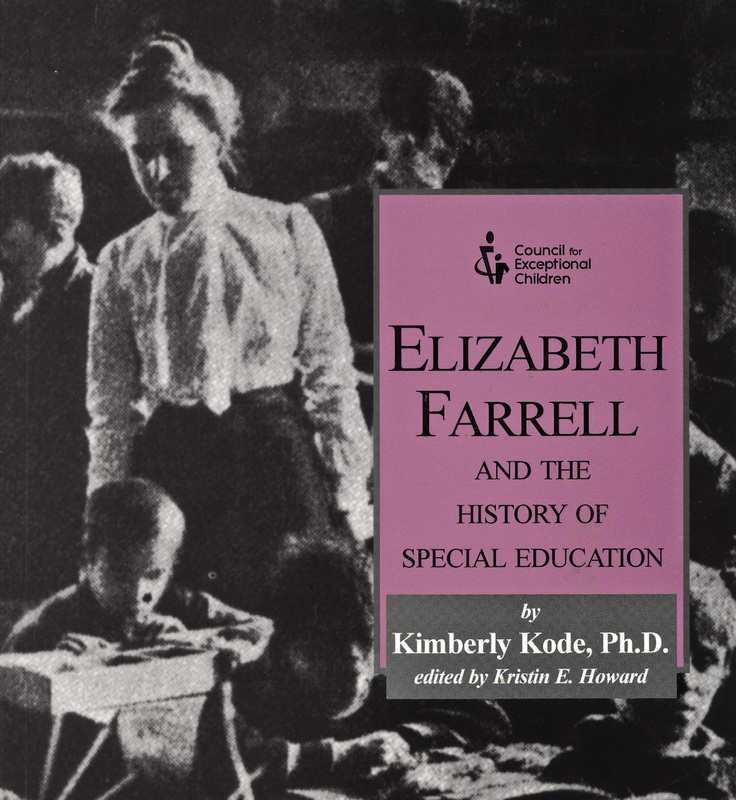 Elizabeth Farrell and the History of Special Education. (Arlington, VA: Council for Exceptional Children, 2002). The children Farrell spoke of were not only impoverished; they also had cognitive and physical disabilities. At the time, most educators and policymakers felt that these children could not be educated or, at best, taught only the most rudimentary skills. Farrell’s statement is remarkable in three ways: that the children of the very poor deserved the same quality education as their richer peers, children with intellectual disabilities should benefit from a rich educational experience by knowledgeable and dedicated teachers, and these children and young adults should be with their regular peers to the greatest extent possible. To be sure, certain events influenced Farrell. She admired her own teachers from the Utica Catholic Academy, the Sisters of Charity, for their work with the sick and needy. After she graduated the academy, she enrolled at the Oswego Normal & Training School, whose curriculum was based on the pedagogy of Johann Heinrich Pestalozzi, the Swiss educator who worked with the children of the very poor. This young lady took these lessons and set out to teach in New York City’s Lower East Side, one of the toughest neighborhoods in America in 1899. And one of the toughest schools was Public School Number One, the Henry Street School. It was there Elizabeth Farrell met Lillian Wald, the person who founded the adjacent Henry Street settlement, a boarding house that cared for and taught the children of the very poor. Many of the students at Henry Street were deemed “incorrigible” or “uneducable.” The rote teaching of dry facts was difficult for most children, but for Elizabeth Farrell’s population, it posed an insurmountable obstacle. Farrell set out to find “the right education—the kind of teaching… [the special student] needs, therefore which he accepts.” Under the watchful but supportive eyes of her principal and senior administrators, Farrell set out to create her special-education curriculum, one adapted to the diverse needs of her pupils. Farrell had the students engaged in meaningful manual tasks that would instill a love of work. Like Jane Addams, Elizabeth Farrell expressed a strong disdain for a criminal justice system that entrapped so many children in a sordid world of adult crime. “The school, now more than ever, must compete with its only real competition, the street,” she said. The biography of Elizabeth Farrell would certainly be worthy of a full-length book. However, if a quick yet comprehensive introduction to this remarkable lady is what you seek, this short book does an admirable job. Everyone working with children with special needs should know about Elizabeth Farrell and her timeless legacy.